This Idea Thief is a super easy idea for curtains. They are "pin-up" curtains. As far as I can tell, they remind me of roman shades, but are much easier for the non-sewer. You could easily use hemming tape and then hand stitch the hook and eyes. You don't have to worry about loops on the back and pull strings. Plus, if you have little ones, they are much safer since they don't have pull strings (which are a strangulation risk). 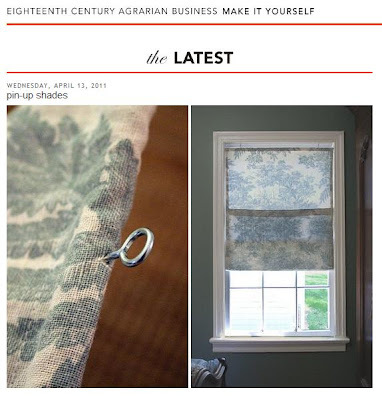 Check out Eighteenth Century Agrarian Business for the easy tutorial! those are really pretty! I'm going to check out the tutorial and cross my fingers I can follow it cuz these would be great for my kitchen!